One girl must decide which parts of herself to hold onto and which to leave behind. A moderated talkback will follow the show each night. On September 17th the talkback will be led by Dr. Tiffany Gill. On September 18th the talkback will be led by Dr. Jennifer Wilks. Ample parking is available close by in the following garages on the UT Campus: Manor Garage, Trinity Garage, and Brazos Garage. Additionally, the #7 bus and the West Campus and Forty Acres campus shuttle busses stop very near the School of Social Work. General Admission for Crooked Parts is $10. Student tickets are available for $8 (with ID). Tickets are on sale now and available for purchase online at Brown Paper Tickets. 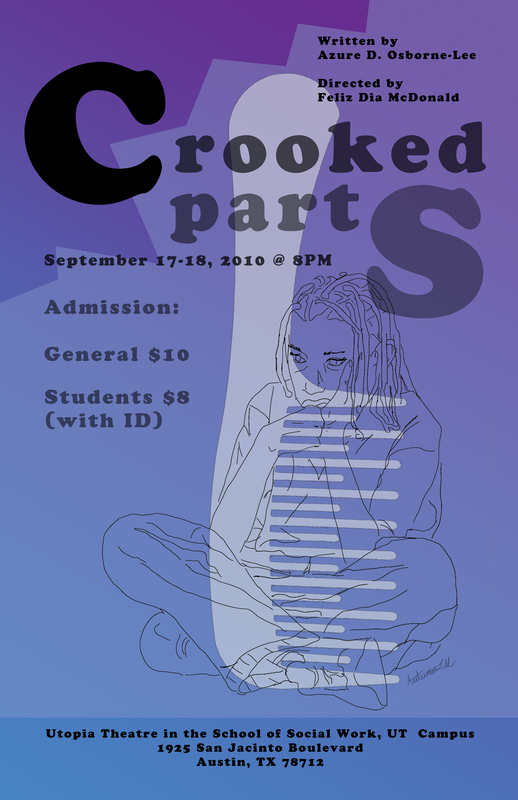 This production of Crooked Parts is generously co-sponsored by the Center for Women’s and Gender Studies, the Gender and Sexuality Center, the John L. Warfield Center for African and African American Studies, ProArts Collective, and Austin Community College Department of Drama. ← CROOKED PARTS: Save the Date!